Just as Industry 4.0 is talked of as an almost mystical phenomenon still someway down the road for manufacturers, the same can be said when it comes to the Factory of the Future. In reality, the future has already arrived, and manufacturers need to act now if they are to remain competitive in the digitised global marketplace. We first started talking about Industry 4.0 in 2010, and since that time, our factories have become smarter and more agile as new innovations have been realised. So while it’s true that many elements of Industry 4.0 are still conceptual, many have already arrived, making the smart factory the facility of the here and now. One of the greatest challenges for manufacturers in adopting Industry 4.0 is cost. For small facilities especially, making significant investments in new equipment can be difficult, particularly if gaining internal buy-in is a time-consuming process. While the benefits of a smart future are becoming increasingly well-known, this has left some manufacturers feeling a sense of panic and urgency as they believe the answer is a complete digital overhaul. It’s important to remember, though, that creating your Factory of the Future isn’t an overnight job – a task which would be near impossible for even the most well-resourced business. Instead, taking a considered and incremental approach is one that will deliver the most value, particularly for small manufacturers. Where the cost of implementation needs to be balanced with the value of digital upgrades, Bosch Rexroth’s digital twin can help. 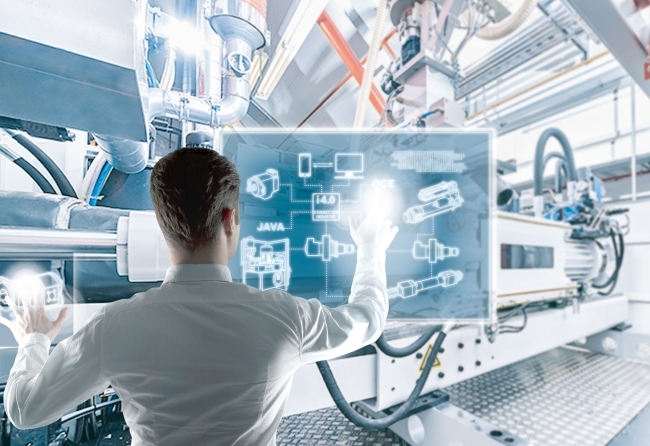 A key element in smart manufacturing, the digital twin creates a virtual replica of your entire physical factory which can be used for test and development. Precisely reflecting its counterpart in the real world, manufacturers can measure performance just as they would in reality. So instead of purchasing and installing new equipment before seeing its value to the production line, manufacturers can set it up virtually. That way, once it’s switched to the physical twin, there will be no changes, no surprises, no false starts. That means the first physical product will be right every time – and in today’s increasingly flexible and customised environment, it will need to be. So for small businesses, the price and quality of any changes can be accurately gauged before a penny is invested. Another way for facilities to realise their vision of the Factory of the Future is through readily available distributed intelligence. This enables production machines to assess themselves, share information with other equipment, and make their own consensus-based decisions. With the starter kit from Bosch Rexroth, you could step into the digital future today. Complete with up to 15 sensors to attach to existing machines, the kit allows you to collect data from the factory floor and stream it to the cloud for real-time analysis. Better yet, the entire system can be fitted and activated in a single morning, so you can see the possibilities of a connected future almost immediately.